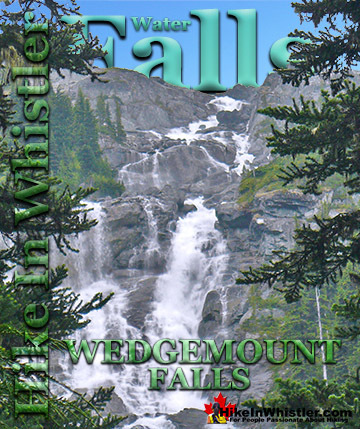 Alexander Falls is a very impressive 43 metre/141 foot waterfall just 30 to 40 minutes south of Whistler in the Callaghan Valley. 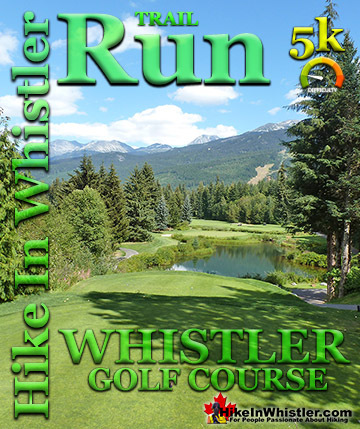 Open year-round and located just before Whistler Olympic Park where several of the 2010 Olympic events were held. There is a nice viewing platform on the edge of the cliff across from the falls which crash fantastically into the valley below. Ancient Cedars is a nice, easy/moderate 2.5 kilometre(1.6 mile) hiking trail on the far side of Cougar Mountain, just 10.8 kilometres north of Whistler Village. A small, untouched grove of huge western red-cedars hidden high up in the mountains. Often overlooked by hikers, certainly there are other groves of massive cedars found in other Whistler area hikes. Black Tusk is the extraordinarily iconic and appropriately named mountain that can be seen from almost everywhere in Whistler. The massive black spire of crumbling rock juts out of the earth in an incredibly distinct way that appears like an enormous black tusk plunging out of the ground. 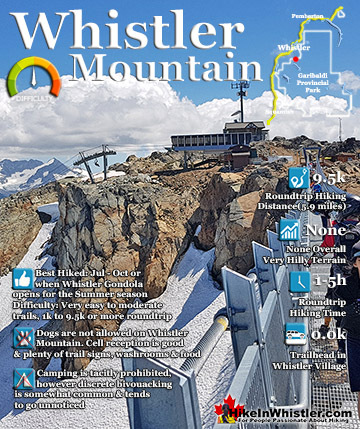 Whether you spot it in the distance from the top of Whistler Mountain or from vantage points along the Sea to Sky Highway, its appearance is breathtaking. Brandywine Meadows is a nice, relatively short hike to a massive flower filled valley high up in Callaghan Valley. 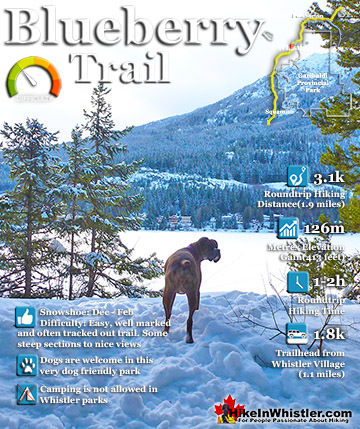 Located 40 minutes south of Whistler, this tough and sometimes muddy trail gains a huge 550 metres of elevation in just 3 kilometres(1.9 miles), trailhead to meadows. The trailhead is tricky to find and involves a fairly long gravel road journey that is passable without a 4x4, but barely. 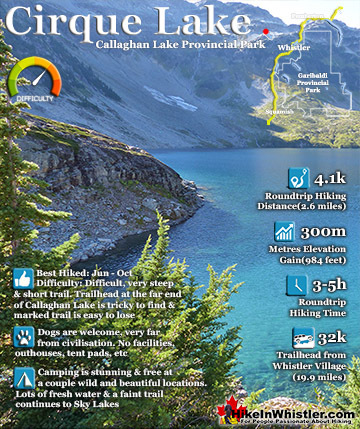 Callaghan Lake Provincial Park is a relatively untouched wilderness of rugged mountainous terrain. The valley walls were formed by relatively recent glaciation. Evidence of this can be seen in the considerable glacial till and slide materials visible across the lake. 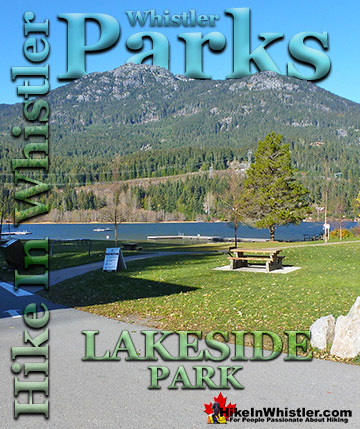 Around the lake you will see talus slopes, flat rock benches, cirques, hanging valleys, tarns, waterfalls and upland plateaus with bogs. 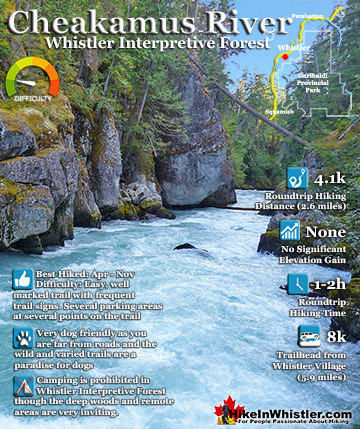 Cheakamus River is a beautiful, crashing, turquoise coloured river that flows from Cheakamus Lake, through Whistler Interpretive Forest at Cheakamus Crossing, then down past Brandywine Falls to Daisy Lake. 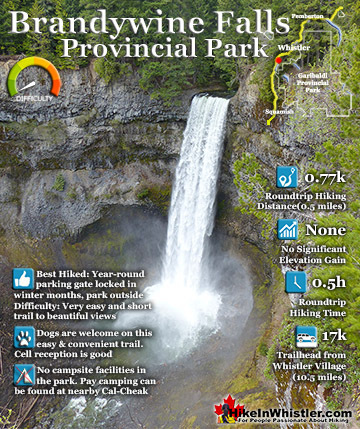 Also a popular kayaking route, the main attraction to Cheakamus River is the wonderful and quite extensive network of hiking and biking trails that run along either side of it. 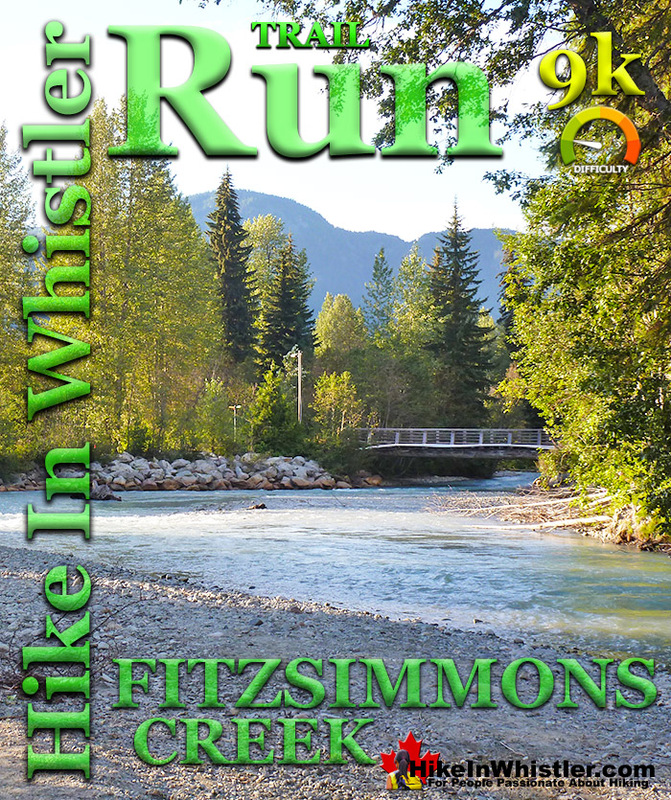 The Riverside trail and the Farside trail run on either side of Cheakamus River and connect at both ends by bridges. Cirque Lake is a wild and beautiful lake that hides high above and beyond Callaghan Lake in Callaghan Lake Provincial Park. 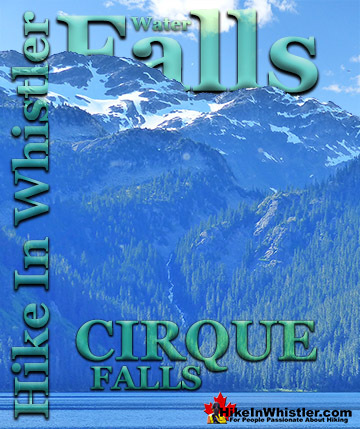 What makes Cirque Lake special among the other sensationally beautiful lakes in the Whistler area is both its location and geologically formed shape. 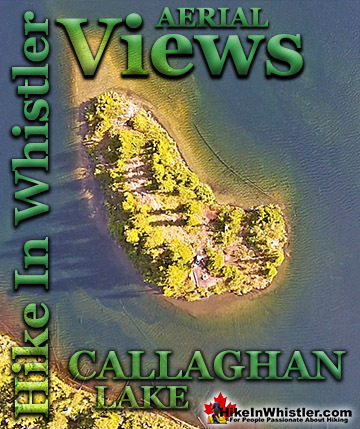 It sits high above Callaghan Lake, which itself is a gorgeous, mountain lake. The remoteness of Callaghan Lake is a bit of a mirage due to the fact that you can drive right to it! 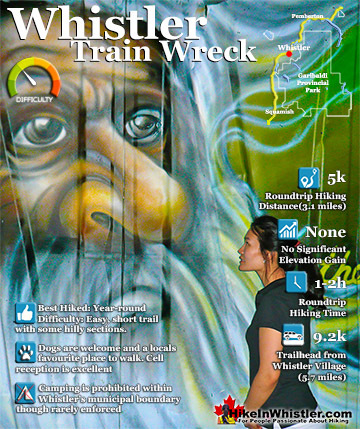 Hiking and biking trails are so abundant in Whistler that many go unnoticed, neglected or taken for granted. The Flank Trail is one of these. 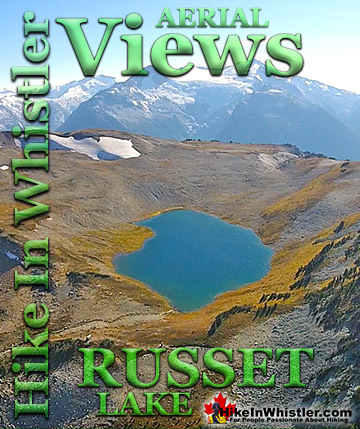 Most people in Whistler don't even know about it, but the ones that do, love it. 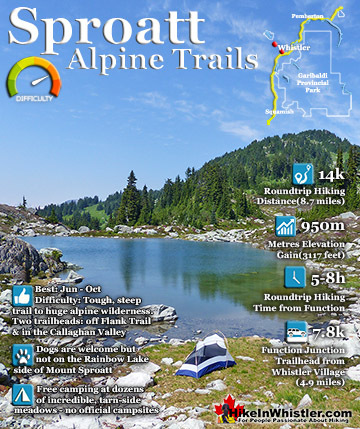 Officially known as the Rainbow-Sproatt Flank Trail, it runs the length of Whistler Valley, opposite Whistler Mountain and Blackcomb Mountain, and connects Rainbow Mountain and Mount Sproatt with dozens of hiking and biking trails. Helm Creek is a cute, meandering creek that winds its way from beyond Black Tusk, down the valley to the wonderful campground that takes its name. From the Helm Creek campground, Helm Creek descends further along the Helm Creek trail, until it joins Cheakamus River, not far from where it leaves Cheakamus Lake. The location of Helm Creek campground is pretty amazing for a variety of reasons. Joffre Lakes Provincial Park is a gorgeous park with extraordinarily coloured lakes, waterfalls, stunning mountain peaks and ominous glaciers pouring into the valley. Joffre Lakes is one of those incredible places that makes it hard to take a boring picture. The three Joffre Lakes are some of the most stunning lakes you are likely to ever see. Each lake gets progressively more beautiful and impossibly turquoise from one to the next. 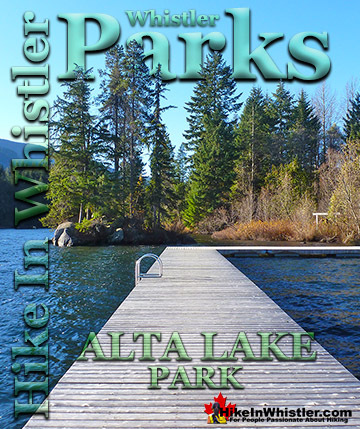 Keyhole Hot Springs (aka Pebble Creek Hot Springs) is located 100 kilometres from Whistler(Village Gate Blvd). Though most of the 100 kilometres is on logging roads, it is driveable by most cars without any trouble. The massive Innergex hydroelectric project has turned this once quiet wilderness into a war-zone. On the plus side, the old logging roads near Keyhole Hot Springs are now well maintained and smooth. 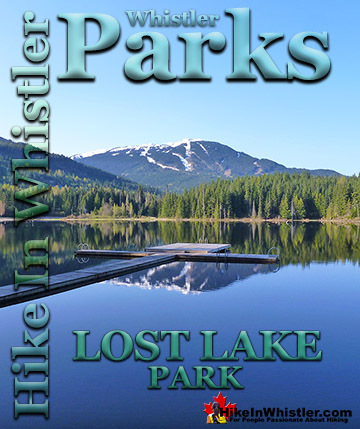 Logger's Lake is an amazing little lake hidden up in the deep forest above the more well known Cheakamus River. The lake, almost unbelievably exists in a long extinct volcano. However, as soon as you see the lake up close, you quickly come to believe it. The lake sits in an almost cartoonish looking, volcano-shaped bowl, with one side of the bowl a crumbling array of truck sized boulders leading down to the lake. 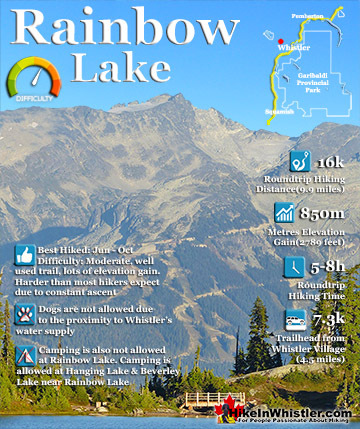 Madeley Lake is a beautiful, remote mountain lake hidden high up in the Callaghan Valley. From Whistler Village expect to take 40 minutes to drive there. You can drive directly to the lake, however the access road is pretty bad with deep waterbars. An average 4x4 can make it quite easily, though most cars with have great difficulty driving over the numerous deep water cut gouges in the road. Located near Alexander Falls, Madeley Lake is close to several beautiful places. 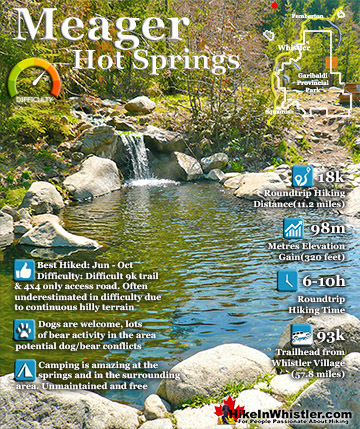 Meager Hot Springs(aka: Meager Creek Hot Springs) is located 93 kilometres northwest of Whistler, was beautifully developed into gorgeous pools, with a caretaker and usage charge. At its height of popularity, Meager Hot Springs had 30,000 yearly visitors. Unfortunately, due to two recent massive landslides it seems unlikely to ever officially reopen. Just a decade ago, in 2009, a nice, expensive access bridge was installed. 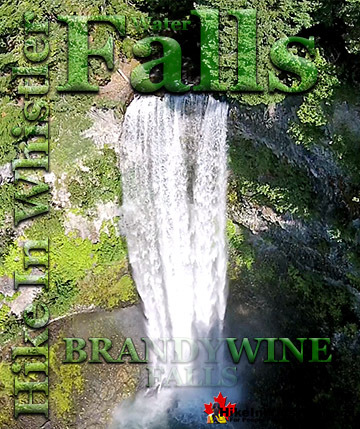 Nairn Falls is a wonderful, crashing and chaotic waterfall that surrounds you from the deluxe viewing platform that allows you to safely watch it from above. The beautiful, green water rushes through the deep and angular channels of rock. 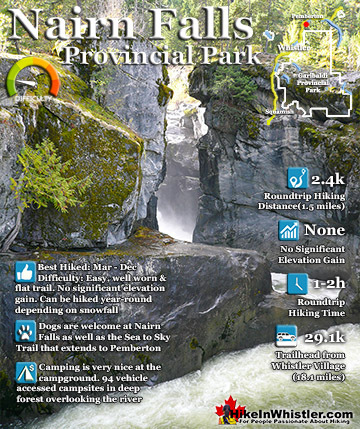 Nairn Falls Provincial Park is centred around a very large drive-in campground and the short, 1.2 kilometre(0.7 mile) trail to the falls. 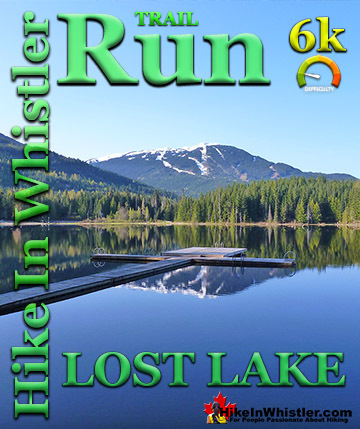 Whistler has an absurd number of wonderful and free hiking trails and Parkhurst Ghost Town certainly ranks as one of the most unusual, exotic and interesting. 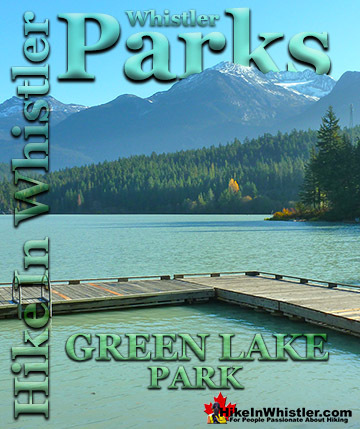 Parkhurst was a little logging town perched on the edge of Green Lake way before Whistler was Whistler. Up on the ridge where Parkhurst sits, the views are sensational. Green Lake far below, a solid unnatural looking mass of green. The short, winding, and ever-changing hiking trail to Rainbow Falls is the same as the much more popular trailhead for Rainbow Lake. 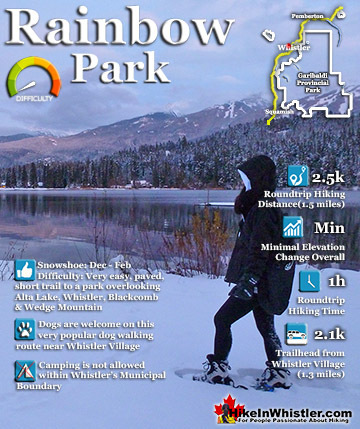 The trailhead is marked as the Rainbow Trail, and the trail quickly ascends into the forest winding left, right, up and down almost constantly. 21 Mile Creek, always on your right can be either seen or heard as you hike through the forest to the somewhat hidden Rainbow Falls. 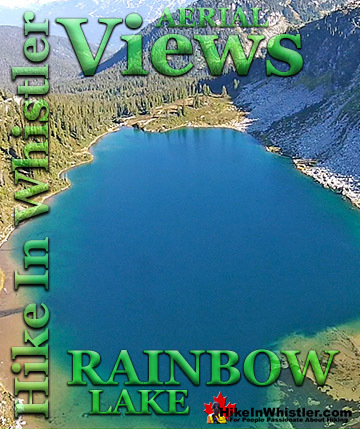 The Rainbow Trail is a convenient and popular trail near Whistler Village that takes you to Rainbow Lake as well as the Rainbow-Sproatt Flank Trail, Rainbow Falls, Hanging Lake, Madeley Lake, Beverley Lake, Rainbow Mountain... and even Whistler Olympic Park if you are determined. 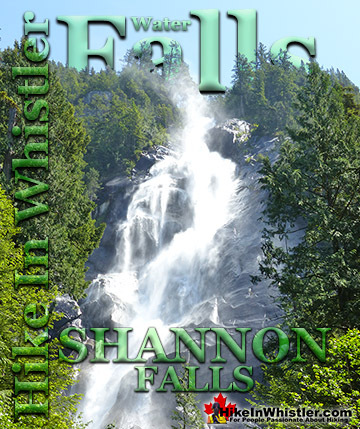 It is a consistently uphill and very beautiful trail with several water (bridge) crossings and waterfalls on the way to the picture-perfect lake. Ring Lake is a fantastically serene and wonderfully remote lake similar to Cirque Lake, but considerably farther to hike to reach it. The 10 kilometre(6.2 mile) hike takes you through a rarely hiked forest, then to an idyllic meadow filled with ponds and ringed with distant, mountains, then finally up an over some steep terrain to reveal this very hidden lake. 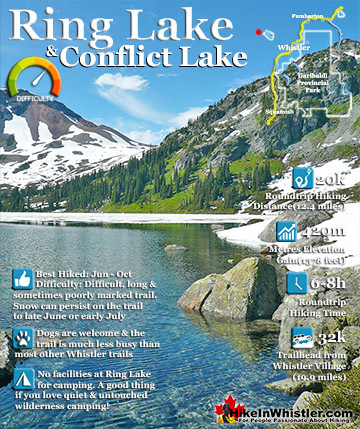 5 kilometres(3.1 miles) into the hike you come to Conflict Lake with trails running around it. 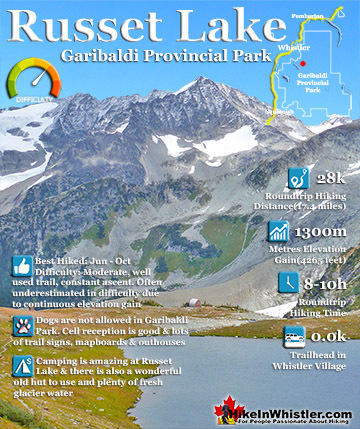 Russet Lake is a surreal little paradise that lays at the base of The Fissile, in Garibaldi Provincial Park. 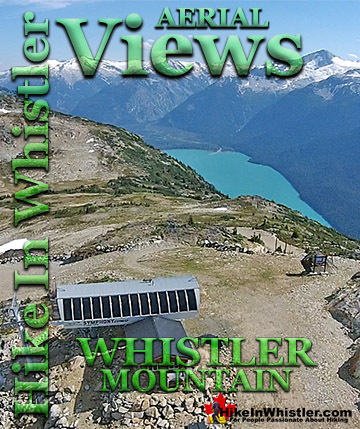 The Fissile is the strikingly bronze mountain visible from Whistler Village. From the Village look into the distance at the Peak2Peak Gondola hanging between Whistler Mountain and Blackcomb Mountain and you will see The Fissile. Its pyramid shape in the distance perfectly separates the two mountains. 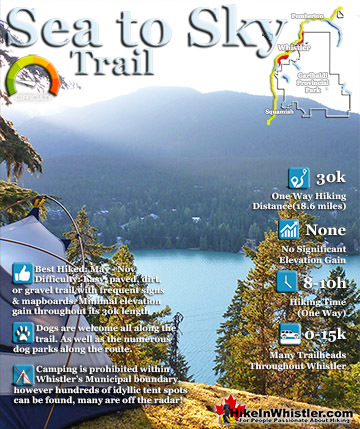 The Sea to Sky Trail is a 180 kilometre multi-use trail that runs from Squamish to D'Arcy. 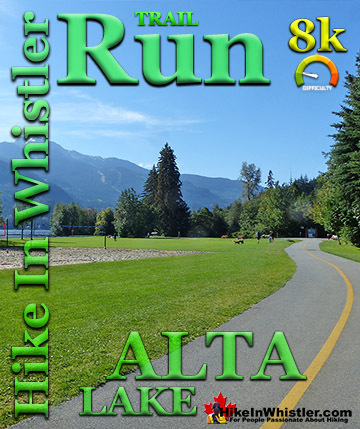 The trail is still under construction in many parts, however, the amazing route through Whistler is finally in place. 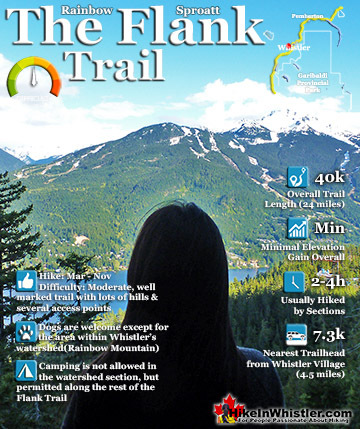 The Whistler section of the Sea to Sky Trail is 33 kilometres long between Brandywine Falls Provincial Park and WedgeWoods Estates just north of Green Lake, near the trailhead for Wedgemount Lake. Skookumchuck Hot Springs(aka T'sek Hot Springs and St. Agnes Well), located two hours north of Whistler along the edge of the huge Lillooet River. The name Skookumchuck means "strong water" in the language of the Chinook people of the Pacific Northwest. The name is associated with the hot springs because of the nearby First Nation community of Skatin, which was once called Skookumchuck. 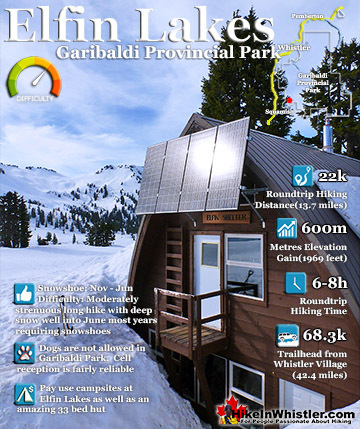 Taylor Meadows is a very scenic campsite and great alternative to the much busier and more well known, Garibaldi Lake campsite. 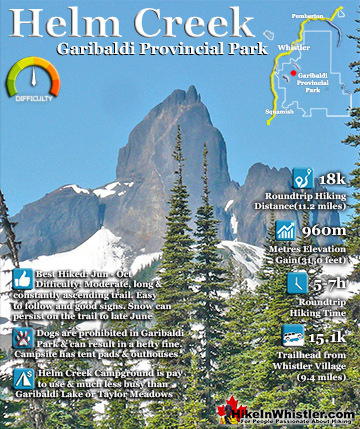 Located in Garibaldi Provincial Park between Garibaldi Lake and Black Tusk, Taylor Meadows is best hiked to from the same trailhead as Garibaldi Lake at Rubble Creek. 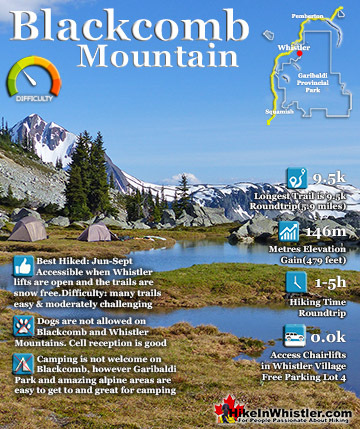 There are 40 tent platforms, toilets, a good water source and food cache, all in the lush forest of Taylor Meadows with great views of Black Tusk. The trail to Whistler Train Wreck is an easy, yet varied route through deep forest, across a great suspension bridge over Cheakamus River, to a stunning array of wrecked train cars. The trail from your car to the wrecks only takes about 15 minutes, however once you reach one wreck, you see another, then another. There are seven wrecks in total that are spread over an area about 400 metres long. 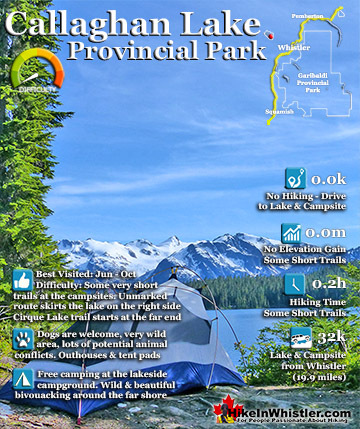 Wedgemount Lake itself is a magnificent destination for a day hike or spectacular overnight beneath the dazzling mountain peaks and stars above Garibaldi Provincial Park. Many sleep under the stars on one of the many beautiful tent platforms that dot the landscape. Solidly built, wooden tent platforms are everywhere you look at Wedgemount Lake. Strategically positioned, these platforms manage to maintain a secluded feel despite their numbers. 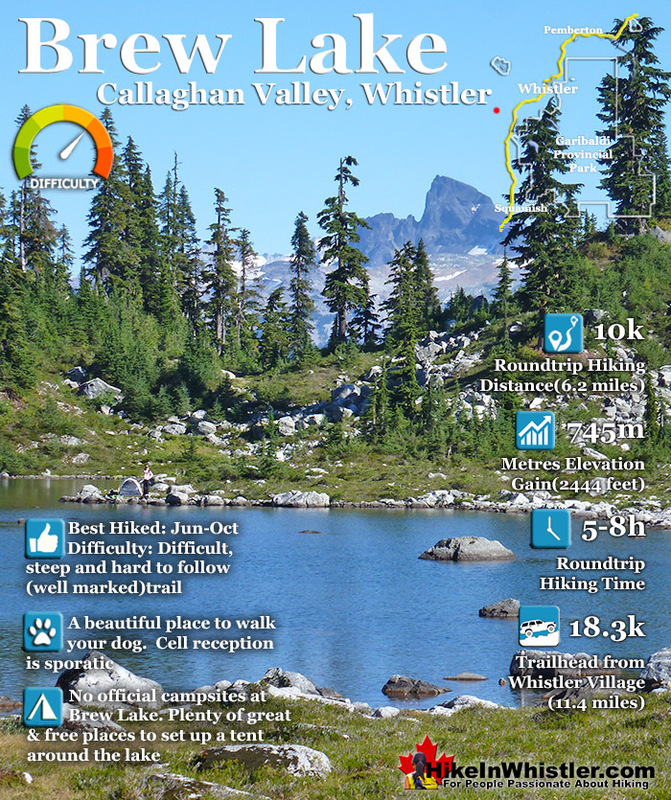 The alpine hiking trails on Whistler Mountain are the ultimate in luxurious, quick-access alpine hiking. 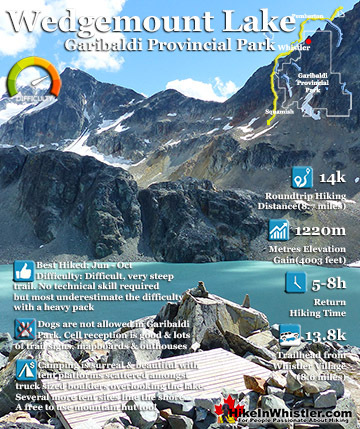 Little effort gets you amazing views of turquoise lakes, snowy mountains, valleys of flowers and distant glaciers. The Whistler Gondola takes you to the Roundhouse Lodge where you find gift shops, restaurants, viewing decks and the new Umbrella Bar.